We were sitting in a coffee shop discussing the way forward with our pastor. Eric suggested taking his studies from part time to full time so that it could get done quicker and get back to earning a salary. I agreed to support him and had no problem with him going full time, in fact I preferred it that way. So I said, "Don't worry, I can take care of us financially while he is studying. I am making enough money in my business to support us." Then out of the blue when I was praying one day God reminded me of what I said that day in the coffee shop, "Don't worry, I can take care of us financially", and he showed me how that one little sentence was causing all this trouble. I had repented of pride in general but not of saying these specific words. Our words create our world and so when I said these words I took hold of the yolk of the aeroplane from God and I became our provider. Clearly I was not a very good provider. As soon as I saw the power in the words I had spoken, and what they had done, I repented and asked God to please be our provider again. I realised that all that time I was standing in the way of God's blessing. As soon as I got out of the way the cash flow started to return and I started to get back to steadily building the business with God's help and for his glory. 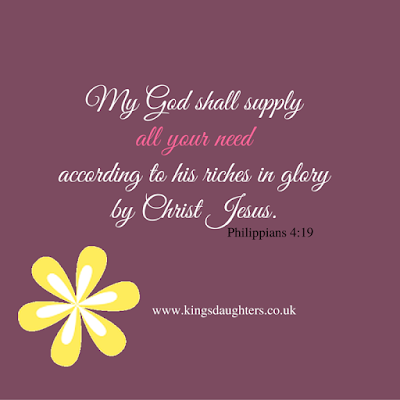 I don't know what will happen next but I do know that whatever happens it will be OK, God is in control and my God shall supply all my need according to his riches in glory by Christ Jesus. How about you - are you struggling in any particular area? Are you perhaps standing in the way of the blessing and the breakthrough? Is there anything that you have said or done that needs to be dealt with? I so hope my little story will help someone. It's not easy to share this but for your sake I do, I hope it helps.